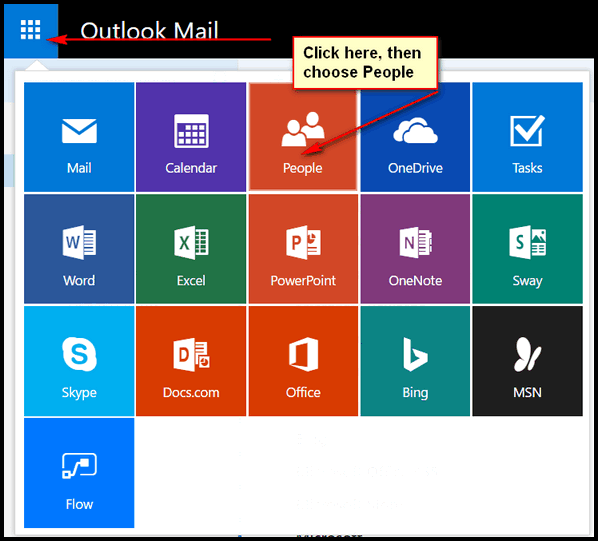 All Microsoft accounts are now accessed through Outlook.com. So if you have an email address that ends in @outlook.com, @hotmail.com, @msn.com, @live.com, @live.ca). this tip is for you. Most of you who have Microsoft addresses know that Microsoft has consolidated them all into Outlook.com. So if you have any Microsoft address (@outlook.com, @hotmail.com, @msn.com, @live.com, @live.ca), we’re going to show you how to export your contacts. It is very easy to do, even if Microsoft doesn’t make exporting your contacts very obvious. First of all, just for this tip, if you’re using Windows 10, you must use Microsoft Edge or Firefox (and not Chrome) to export your contacts. If you’re using Windows 8.1 or Windows 7, you must use Internet Explorer or Firefox to export your contacts from Outlook.com. Hello from Nova Scotia folks. I’m having troubles when I follow your directions. When I go to #2 and click app icon I do not see/get the Outlook MaIL you show mainly “People”. Were has this old buzzard gone wrong? I have no idea. Those screen shots we’re taken recently ( a couple weeks ago) directly from Outlook.com – so I can’t tell you why you’re seeing something different. Arnie, jusr came across this. Be sure you are using Edge browser, not Chrome, as you cannot see it in Chrome Browser.